In 2009, a fast-moving windstorm known as a derecho swept through this site, near Fountain Bluff in Illinois. A tornado hit this site in the Shawnee National Forest in February 2017. 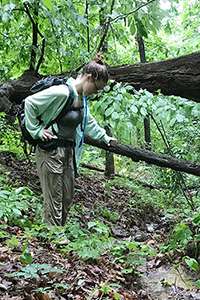 SHAWNEE NATIONAL FOREST, Ill. – We walk out of the typical southern Illinois shady forest into a crazy jumble of fallen trees, thorny vines and tangled shrubs. It’s almost 100 degrees, the humidity is over 85 percent and all of the shade has disappeared. My lab mate and her undergraduate technician volunteered to work with me today, and I wonder what I’ve gotten them into. The author and her technician, Amanda Neibuhr, foreground, survey a wind-damaged site. 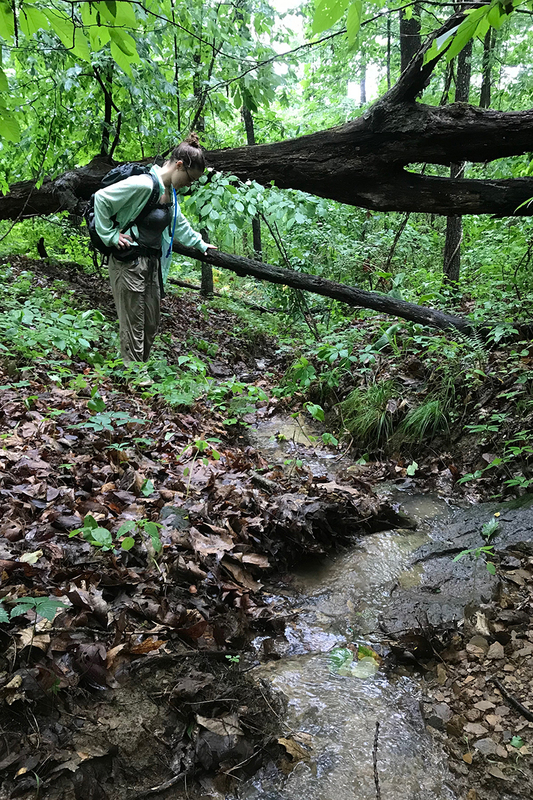 We’re surveying near Kinkaid Lake in the Shawnee National Forest. 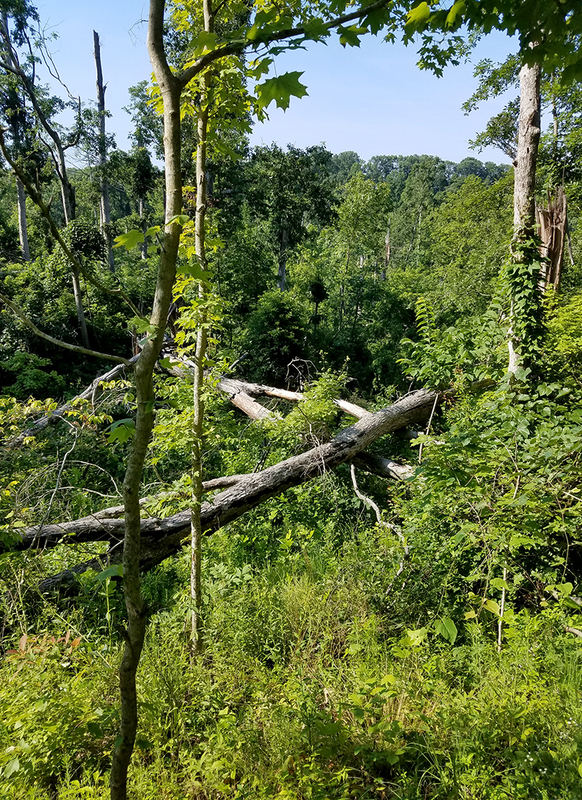 I am studying how invasive plant populations in southern Illinois forests respond to windstorms. A little over a year ago, a tornado with winds near 145 mph swept through here. The forest looks exactly as you’d expect. 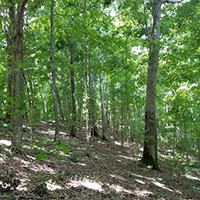 There are few canopy trees left standing and understory plants – many of them invasive – have taken over. In a few years, the forest should recover to look like some of the other sites hit by windstorms nine to 12 years ago. 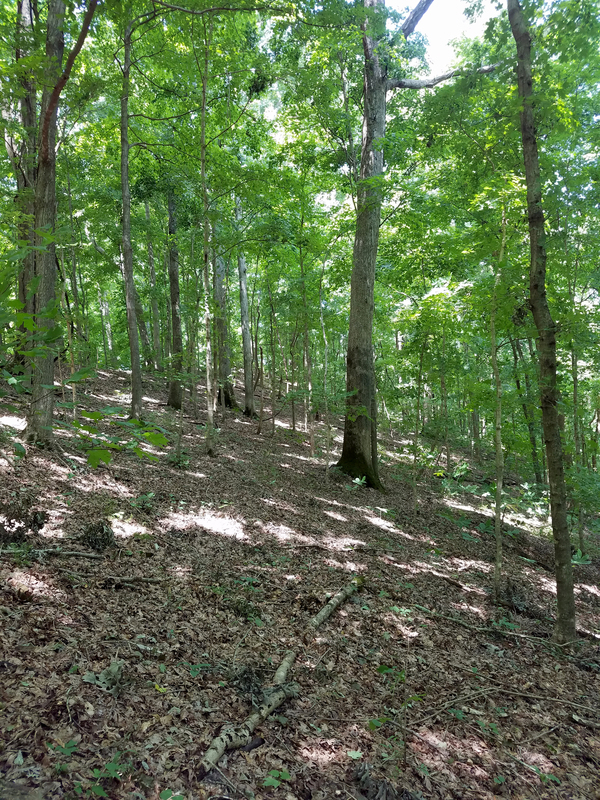 The canopy trees should grow back, shading out the understory and causing declines in invasive plants. 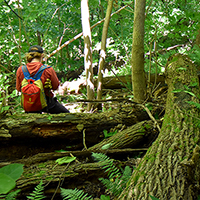 Downed trees let in sunlight, giving invasive plants an opportunity to take hold. 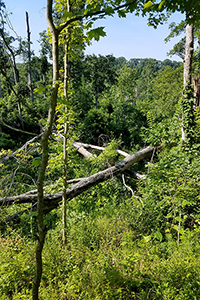 A 2009 derecho also affected this site in Crab Orchard National Wildlife Refuge. A massive windstorm swept through the Shawnee National Forest in 2009. That ideal recovery scenario does not always occur, however. 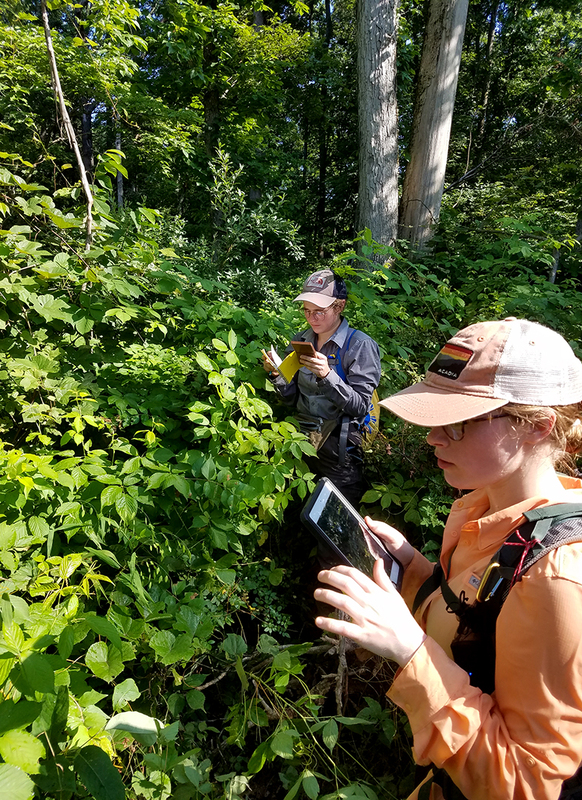 While many of the sites disturbed in a previous storm about a decade ago seem to be recovering well, others are dense with invasive plants. When enough of the wrong invasive plants are present before a windstorm, they can prevent the regrowth of the tree canopy. 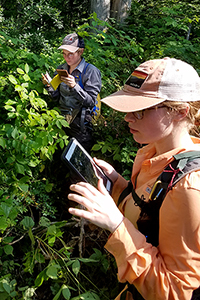 If the invasive plants that establish immediately after the windstorm can tolerate shade, they can grow into surrounding forest or persist after canopy regrowth. 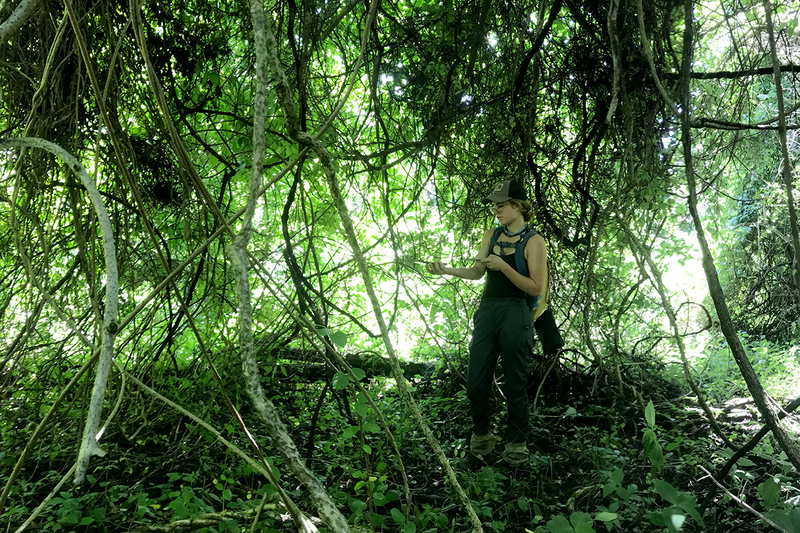 I step onto what I think is a stable thicket of vines and shrubs and immediately sink into vegetation up to my chest. Today is shaping up to be one of the hardest days of field work I’ve ever experienced. This forest has not been affected by windstorm damage. The researchers use it for comparison with the damaged sites. The data we’re collecting is worth the struggle, however. 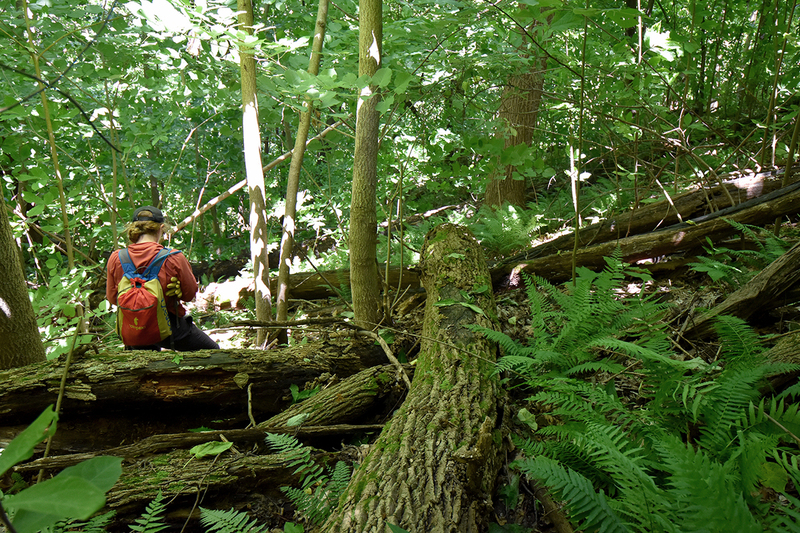 Southern Illinois forests may be unforgiving places full of ticks, poison ivy and thorny vines, but they are beautiful and dynamic places, as well. I wonder to myself what this site will look like in a decade. I'm excited to read the story that our data will write about the forests’ recovery. Natural resources and environmental sciences professor Eric Larson is Melissa Daniels’ adviser.